This is a sequel to Top 10 Amazing Mosaic Artworks, which I highly suggest you visit to get the gist of the list. I love modern art, and the lengths to which people will go to express themselves through it. Mosaic art is a particular favorite of mine, and it just fascinates me how people today can do so much with this ancient art form. Here are ten more unusual and fascinating mosaic artworks that will definitely catch your attention. 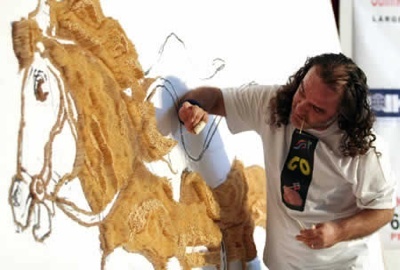 Saimir Strati, an Albanian artist, holds the Guiness World Record for creating the largest toothpick mosaic. The 86.11-square feet creation is made of 1.5 million toothpicks, and took 40 days to complete. The mosaic, which depicted a galloping horse, was displayed at the Arbnori International Centre of Culture, Tirana, Albania on 4 September 2007. Saimir Strati gets another spot on my list for his other record-breaking piece, a 988-square feet mosaic made of 229,675 bottle corks. 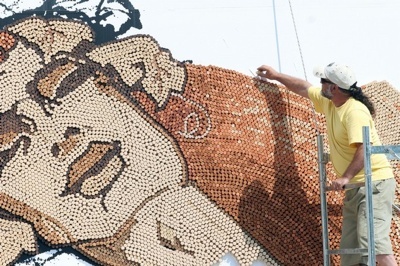 Depicting the theme ‘Mediterranean’, the giant mosaic was unveiled on Sept. 4, 2008 along with 9 other mosaics, including two other record-breaking mosaics made out of nails and toothpicks (see previous entry). Surprisingly, the giant installation, which was displayed in the gardens of the Sheraton Tirana Hotel and Towers, took only 27 days to complete. Jaina Davis of San Francisco, California, owns a house with a difference. The house, whose interior was decorated by various artist friends of Davis, boasts an amazing staircase completely covered in pencils. 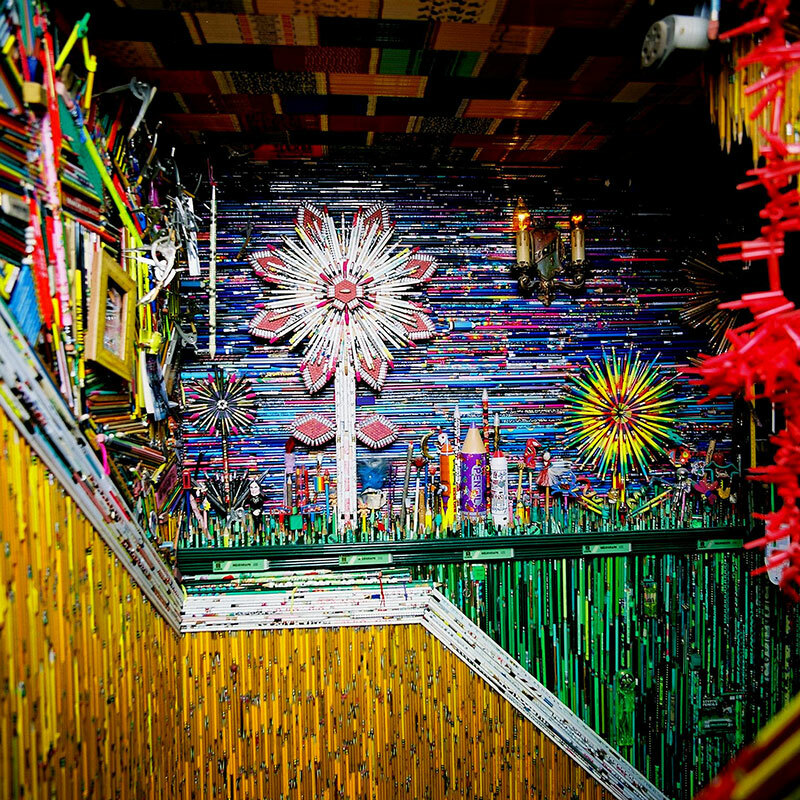 The staircase, entitled ‘Pencil-vania,’ was made by Jason Mecier, and features a flower garden mosaic and a futuristic portrait of Jaina Davis, aged 88, all made from pencils. The installation, which took five years to build, contains 92,626 pencils, plus various erasers, sharpeners and other school supplies. Artist Ran Hwang specializes in creating stunningly beautiful images out of buttons. The buttons are pinned on the surface to create pictures such as birds, trees and Buddha figures. To see more of her whimsical art, go here. 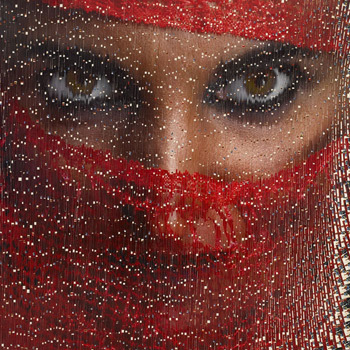 Scottish artist David Mach creates amazing artworks out of thousands of postcards. One particularly amazing work is his depiction of a racehorse made from 8,000 identical postcards of the Jumeirah Emirates Towers in Dubai, which measures 12 by 9 feet. To see more of Mach’s works, go here. 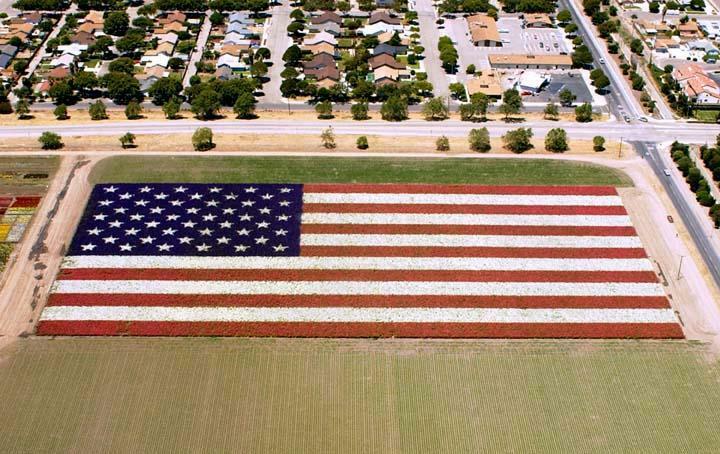 In celebration of Flag Day in June 14, 2002, the city of Lompoc, California, created a 740 x 390 foot US flag made out of 400,000 larkspur flowers. 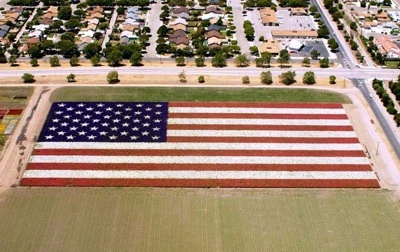 The flag covered 6.65 acres and the stars measured 24 feet in diameter. 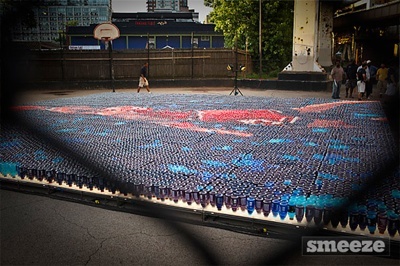 To celebrate his induction into the Naismith Memorial Basketball Hall of Fame, Gatorade teamed up with an American advertising agency to create an amazing mosaic of ‘His Airness’ Michael Jordan from 14,641 Gatorade bottles. The mosaic, illuminated by 200 light boxes, took 16 hours to complete and used limited edition Jordan Gatorade bottles in various flavors. On March 17, 2008, students of the Institute of Hotel Management, Catering Technology and Applied Nutrition in Mumbai, India succeeded in breaking a very unusual record. 20 students gathered to create a 15.16-square meter mosaic made out of 5,814 sushi pieces, breaking the previous record set by the Association of Chartered Certified Accountants (ACCA) in Poland, which measured 14.84 square meters. Maki Sushi, Inari Sushi, Nigiri Sushi, Uramaki Sushi, and Chirashi Sushi comprised the mosaic. On July 26, 2008 Hong Kong Youth Visual Art Association, Hong Kong Chinese Arts Festival, Lo Fung Art Gallery Ltd and Hong Kong Union of Visual Artists Limited, along with 2,000 participants, teamed together to create the largest origami mosaic in the world. The event took nine hours, and entails the creation and pasting of over 100,000 colorful origami stars. The finished mosaic measured 3,453 square feet, depicted five pandas joining hand in hand, symbolizing the Chinese people’s welcome to the coming of the 2008 Olympics in Beijing, China. 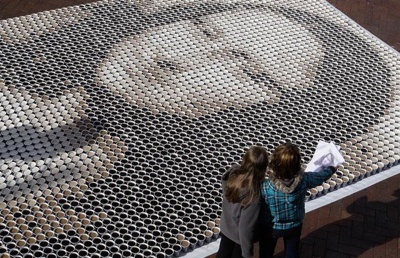 In late 2009, a mosaic reproduction of the famous painting Mona Lisa made from 3,604 cups of coffee was created for the Rocks Aroma Festival in Sydney, Australia. Measuring 20 x 13 feet, it was created by the Sydney Harbour Foreshore Authority. A team of eight people took three hours to arrange the cups of black coffee, which are ‘shaded’ into different sepia tones by 564 pints of milk.